The fourth biennial meeting on the Biology of Cancer: Microenvironment & Metastasis was held at Cold Spring Harbor Laboratory October 10-14, 2017. 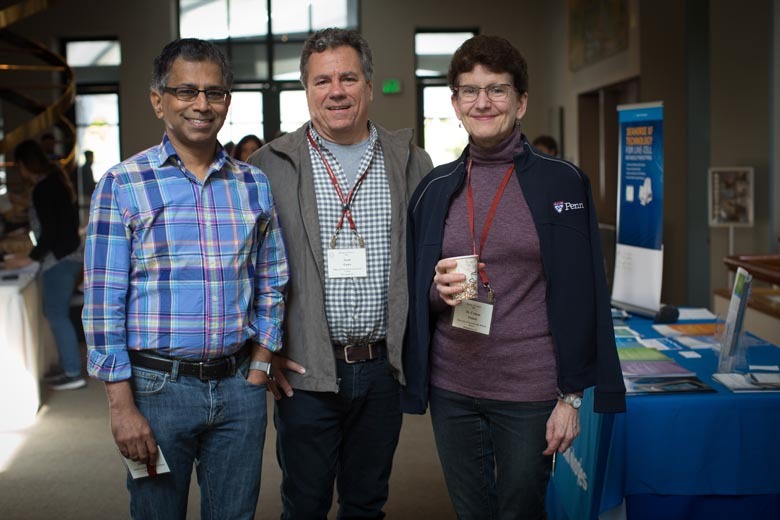 One of a handful of CSHL meetings focused on cancer research, we spoke with the co-organizers, Scott Lowe, Senthil Muthuswamy, and M. Celeste Simon, about the unique aspects of their meeting. To kick off the discussion, Senthil---one of the meeting’s founders---shared his vision for the inaugural 2011 meeting and how it’s evolved over the last six years. Senthil: The idea was to have a Cold Spring Harbor-style meeting that focused on cancer biology as a whole, a small-meeting version of AACR that covers microenvironment, metastasis, imaging for detection, trials, and sometimes therapies as well. The more clinical and translational aspects have since been removed because there is a clinical trials companion meeting for the first time this year (Next Generation Cancer Clinical Trials). We are therefore concentrating mostly on biology in this meeting, and will probably stay like this as long as the companion meeting continues. Also, this year we introduced a career session, a talk given by Bruce Zetter followed by a dinner organized by CSHL. Bruce has been giving career talks to Harvard students and Damon Runyon Fellows about topics like funding in cancer research. I’ve heard positive reactions about the talks, so I thought it would be good to invite Bruce here and couple his talk with the career dinner. Celeste: Because of combinatorial approaches to therapy, we're starting to hear of ways to broaden what’s working for some patients. Obviously, there’s a very reasonable and appropriate emphasis on the immunology therapy right now but, like every other approach, it doesn’t benefit everybody. So how can we combine things in a way that more patients durably respond? It goes without saying that the more you know, the more tools you can bring to the table. But we now have so many tools: It’s not that there aren’t enough treatments, there may almost be too many and we don't know who to treat with them or how to best combine them. By understanding all the different mechanisms and interactions between cells and the tumor environment, I think we can logically design trials that will more likely be successful. Scott: In contrast to CSHL’s other major cancer meeting, (Mechanisms & Models of Cancer) which originated from cancer genetics, this meeting concentrates on the tumor microenvironment. Here, you get a lot more epigenetics and things that are not simply or directly derived from gene mutations. One thing we’ve seen over and over again, a very interesting and somewhat terrifying aspect of cancer, is this sort of plasticity cells have that isn't driven so much by gene mutations, but is maybe enabled by them to change cell fate. This has long-range implications not only for cancer evolution but therapy response as well. We heard from Cory Abate-Shen's talk, for example, of cells that can become resistant to a target of drugs by changing their natures so they no longer care about that target. I think that’s surprising and a really important result. Senthil: Along the same lines, a highlight of this meeting is to understand how a tumor cell uses its microenvironment to adapt, and how it dictates or actually learns from it. This bears out in some of the talks we’ve heard where genetics of the tumor dictate the immune interactions. I think this meeting helps bring together these diverse topics and pockets, and then connect them together -- which is hard to do at a large or specialized meeting. Historically, graduate students and postdoctoral fellows make up approximately 50% of the meeting’s attendees each year, so we were curious about how young scientists benefit from participating in this meeting. Scott: Beyond the fact that the vast majority of talks are selected from the abstract submissions and feature new results, this has always been a really interactive venue. People tend to stay on campus and see each other in the poster sessions, at Blackford, and in the bar, so there’s always a lot of discussion. That’s what I think really makes this meeting great. Celeste: Each one of our sessions is a meeting unto itself quite frequently. For me, I’m catching up on a lot of the latest things that I’m a little bit out of date on, like some of the immunology we heard this year. These are very fast-moving fields that would be difficult to catch up on at more specialized or larger meetings. I think everybody benefits. We’ve got PIs, postdocs, students, and even somebody very august like Richard Hynes. He isn’t an invited speaker and I don’t know if there’s anyone from his lab here this year, but he just showed up to learn. Scott: That’s a great validation of the meeting. Scott: I agree that everybody benefits. It’s a great meeting to come to if you’re a senior graduate student interested in cancer but don’t yet know what to specialize in. This meeting will expose you to really cutting-edge work and help you decide what you want to do as the next step. There are a lot of students here thinking about what to do for their postdocs, and that’ll be true in the future too. Senthil: It happens very frequently, it’s a continued trend. Celeste: That’s good! I heard a couple of talks here that I’m going to definitely notify our search committee about. Closely related, this year’s meeting debuted a new element called “Junior Stars Sessions,” which featured talks by early-career investigators. Scott: The sessions highlighting young, rising junior faculty seem to have been a success. The science has been great. Senthil: Lots of work in emerging fields, interesting topics that are not mainstream in some places. Scott: It’s an evolution of what’s special about Cold Spring Harbor meetings. One reason I like the meetings here is that historically, most of the talks come from the abstract submissions. What you're getting is the people who actually did the experiments often are the ones presenting the work and, in many cases, this is the first chance they’ve had to give a big talk. The general philosophy of Cold Spring Harbor meetings is that this is the place where people get to talk about their work at an early stage in their careers. So in addition to disseminating science, we're helping early-stage investigators make a name for themselves. For me, that’s what I want to accomplish as a meeting organizer. Celeste: There are many challenges to launching a lab, but one is being really seen as independent. Many junior stars are kind of at that point where they are just far enough out from their mentors’ labs – who are usually pretty well established. The Junior Stars Session is just a great forum I’d like to see more of, frankly. I’d like to see it become a tradition because of the positive response it’s received; people have come up to me and said they thought it was great. It can really be helpful for those who, in another few years, will be coming up for tenure; this can help them make the connections. Senthil: For students and postdocs to hear a scientist who is up-and-coming, it’s inspirational for them. They don’t just see the big names talking -- they see people who are not too far from where they are being recognized as “Junior Stars.” I think that’s inspirational. The Biology of Cancer: Microenvironment & Metastasis meeting returns to the Laboratory in late September 2019. If you’re looking for a meeting in the years that Biology of Cancer: Microenvironment & Metastasis is not at CSHL, the Mechanisms & Models of Cancer meeting is a great alternative. David: When the meeting started, it mostly looked at specific proteins or genes, studying their dynamics in 3D, and learning about the dynamics and interactions of various nuclear bodies. Over the past two decades, the meeting has evolved to where the questions are now more centered on genome-wide analysis, whether it be by chromosome painting, Hi-C, or RNA-Seq techniques. We’re now looking at the nucleus in a more global sense: how functions take place in the nucleus, how the genome is organized, and how dynamics are altered upon changes in various physiologic states. Edith: Since I first participated in this meeting in 2006, I have seen the evolution David mentioned. Before, it was still quite descriptive: types of bodies, types of RNAs in the nucleus, etc. There has indeed been a shift to the more genome-wide approaches that look at how chromatin is organized. People are also using all sorts of nice tricks to look at mutants and see whether these bodies, structures, and RNAs matter in more developmental and disease-type situations. And the imaging is just amazing now. It’s extraordinary how far one can go with these super resolution approaches, where the live imaging goes really well with the genomic information. To me, we’re seeing the beginning of a whole new era where we can visualize the 4D aspect of the nucleus. Every time we discuss whether we should organize another nucleus meeting, we wonder if maybe things have gone beyond the nucleus. But actually the nucleus keeps being very much at the forefront when it comes to the questions that interest a wide community. Tom: And genetics. These have evolved and are now very powerful. Twenty years ago, I don’t think we ever felt we were going to solve this problem but now, because of the tools, there’s hope that we can actually do it. Something that struck me this year was the confluence of people thinking about different things. In the past, it was rare for somebody to talk about chromosomes, and then talk about lamins, proteins, or nuclear bodies. But now people think in a more holistic way. David: Unlike most other meetings which focus on one aspect of the biology like chromatin, RNA, or nuclear export, this meeting encompasses all of those areas and more. It’s a more systemic evaluation and study of nuclear organelles, looking at all aspects and how they communicate with each other. It brings people from different fields together and so there’s a lot of cross talk at this meeting that, in and of itself, will provide avenues for advances. Collectively, David, Edith, and Tom have attended eighteen CSHL Symposia. We were curious to hear their thoughts on the similarities and differences between their meeting and our annual symposium. Edith: The symposia are one-offs that each explores a different topic, whereas this meeting is about continuity and community. Some of the postdocs who come to the meeting end up as PIs who eventually help run it. David: Both have their advantages. The symposia are structured whereby speakers are all invited and are leaders in the field. It’s good to go to a meeting like that because a leader in a particular field will present very differently than a student or postdoc; there’ll be a lot of big picture insights into how the field should move ahead, so there’s a lot to be learned from that type of meeting. Here, the predominant speakers are students and postdocs. That’s also important because it gives them an opportunity to present their data and get exposure to PIs and colleagues. Attending and presenting at this meeting is sort of, in a way, preparation for having their own lab. Tom: This is not a field dominated by a single expertise that will give you all the answers. Not everyone can do everything. So a geneticist probably doesn’t do biophysics, but they need to know the biophysics and that’s why I think this meeting is so important. Even though you yourself are a specialist, learning about other fields that are relevant to what you’re doing is absolutely beneficial. Edith: The attendees all come here from different angles. They’re not necessarily nuclear experts, but they clearly share interests in understanding how the nucleus behaves and the influences that can happen in more in vivo settings. David: In addition to initiating this meeting, I started a Cold Spring Harbor course called “Immunocytochemistry, In Situ Hybridization & Live Cell Imaging” in the 1990s. The course has evolved over the past 25 years and is now called Quantitative Imaging, but it’s still running. That course and this meeting go hand-in-hanDavid: when those trainees participate in this meeting, they are able to see how the techniques they learned are being applied to answer biological questions. Edith: Another aspect is that there aren’t many other nucleus meetings. And so this is a community of people who like to come back to the same place and re-connect with colleagues they met last time. People are attracted to this meeting and Cold Spring Harbor because of the community. David: As Joe Gall always reminds me, this meeting is the home of the nucleus field. Tom: It’s also very focused on students and postdocs. It’s a Cold Spring Harbor tradition to have a lot of postdoc and grad student speakers, so that’s a reason for especially students and postdocs to attend. This is also a great meeting for people who are not directly in the field to learn about the field. We’re seeing a lot of physicists, chemists, engineers who build microscopes, all getting into this field. I think this has something to do with the complexity and diversity of the question. So this is a great place for people to find out what the biological problem is and how they can apply their expertise and contribute. It really takes a village. Edith: That’s true, how many other fields have attracted the mathematicians, physicists, and chemists? In biology? Not that many and yet they’re flocking to attack this particular set of biological questions. Edith: Right now I’m most excited by the ability to get both genomic and imaging information out of a single cell, and hopefully combine those to really look at the dynamics of nuclear function at every level from the molecule right through to the phenotype. The single cell approaches -- whether it’s imaging or extracting transcriptomes, Hi-C maps, or epigenomes -- the combination of the two is very exciting. You can suddenly see stuff that you suspected (or didn’t suspect!) was there. Tom: Related to that, the appreciation of heterogeneity and variability between individual cells is exciting. As we said before, this is a very complex problem and so to study it, you simplify. But we’re beginning to realize that every cell is a little bit different and there’s no one way to organize the chromosomes. Because of technologies like single-cell biochemistry and imaging, we’re going to learn a lot about the fundamental principles of how these biological systems work. I think that’s where we’re going and I find that exciting. David: I would like to see more work on disorder and plasticity. Most people always think, “This has to be super organized, it has to do this to work.” But I don’t think the cell works that way; from a human evolutionary perspective, that would be very dangerous. So I would like to see more of the general neighborhood that things can take place in, how much leeway is there, and what does it all look like in real cells and tissues, rather than in cultures that have been growing in a dish for 25 years. I think more work in that regard would be extremely insightful. Edith: And a kind of hierarchy as well, to ask if a gene in a particular part of the nucleus at a particular time matters. We used to just watch and say, “Oh look it’s there!” But now we can address the question mechanistically and I think that’s amazing. Tom: Also, we’ve been so busy looking at the fundamentals that we haven’t really applied the knowledge we have to disease models. We use disease as a model system, as natural experiments, but we haven’t truly explored nuclear structure in the context of disease, or in a systematic and focused manner that you can take into the clinic. There’s a lot to be discovered there. On behalf of the organizers, we hope to see everyone back at CSHL for the 2020 Nuclear Organization & Function meeting taking place from April 28 to May 2. The annual CSHL course on Quantitative Imaging is one of our most in-demand courses, attracting -- this year alone -- four times as many applications as it has spots. The course debuted in 2011 as a reinvention of a previous long-running course on immunocytochemistry and live-cell imaging. Jennifer: I go right to the personal statement: I want to know what their motivation is for taking the course. We’re focused not just on microscopy, but on using microscopes as a tool for making measurements – quantitative microscopy – and we’re looking for applicants who recognize the importance of that in their research. We also look for applicants who we think, after having taken the course, will benefit others. So, for example, an application from a lab that develops fluorescent proteins but doesn’t have a lot of classically-trained microscopists would be a great candidate; having a microscopist in that group would be a great help in validating the proteins. Talley: We like to make sure that what they are seeking is a good match for what we're teaching. Jennifer: That’s true. Sometimes people are looking for something different. We also want applicants who, based on where they are in their career, will benefit the most from the course. We often get applications from first-year graduate students and, based on our many years of teaching, we know that’s a bit too early. They have to have their hands in research for a while. Second-year graduate students are borderline. We do take them, and we had a couple this year, but I think third year is the sweet spot. By then, they’ve really figured out what their project is, and they’ll take what they learn here and start using it right away. Talley: I definitely like re-applications too. Jennifer: Yes! We have gotten applications we would like to accept but didn’t because we thought they weren’t quite ready yet. So we’re happy when we see those people apply to the course again; in fact, the chances of their re-application being selected is higher. Jennifer: It’s exhausting. We start at 9 o’clock sharp and for an hour and a half, we have coffee and continental breakfast while going over questions and reviewing anything the trainees didn’t quite get during the previous night’s lab. To me, it’s really important to have a good stretch of time each day for open discussions. After that, we launch into the first lecture of the day, which tends to run for another hour and a half, sometimes two hours. Next is lunch and then it’s another lecture, lab, or both in the afternoon. With the exception of maybe one evening talk, we try not to schedule any lectures after dinner. Instead, we end the day in the lab, and that generally goes until 10 o’clock. Talley: There’s very little unscheduled time from 9 AM to 10 PM, except one hour for lunch and one hour for dinner. Jennifer: If a person has never been involved in this sort of course, then it might feel like a lot. But compared to other courses, we don’t go as late into the evenings; I just think people need a good night’s sleep if they’re going to continue to learn while they’re here. Even though the pace is intense, there’s a lot of time where we’re just talking because the labs are very much set up like that. The TAs and instructors all genuinely enjoy teaching, so they’re in the lab, checking if anyone has questions, chitchatting, getting cornered by the trainees to talk about individual projects at home, etc. So there’s a lot of time when we’re just interacting and getting to know each other, to the point where we’re all sad on the last day that it’s over. Talley: For anybody we bring in as a TA or invited speaker, I see it as a requirement that they be there for the students, because it’s fun and necessary for them to get access to experts. Jennifer: I agree, it’s really important for the trainees to get as much of our time as they want or need. We have always had an analysis component, which is one of the things that makes our course unique. We are serving what we see as a great need: people who want to use microscopy and do analysis need to learn both of them. That’s a very hard thing to do because each topic could easily fill the full two weeks of the course. But the course has changed quite a bit since 2011. For one, a majority of the lectures are now given by people like Talley and me -- people who run core facilities. Our jobs consist of talking to and guiding people who need to use microscopy and use it properly. We do a lot of teaching at home, so we have built up an expertise and understand what the course trainees don't know, and what they need to know. We put a lot of practice into the best ways of presenting concepts so trainees can absorb the ridiculous amount of material we throw at them in a short period of time. We do still have professors and principal investigators, who are absolute experts in their specific applications, come to the course and give seminars where they show really nice, rigorous applications of the type of technology that we teach. Something else that has changed is the technology itself, and we make an effort to keep up with it and stay cutting-edge. For example, we didn’t teach light sheet microscopy at all the first couple of years but as it is now coming of age, we’ve doubled the amount of lecture and lab-time spent on it. Each year, we think of what new technology people should know about – even if they're not asking for it. Talley: In any given year, I can think of things we've added or removed. We used to put more time into two-photo microscopy but have sort of de-emphasized that a bit. We also used to have a sample preparation component that is completely gone now, and we've emphasized super resolution imaging to varying degrees. The different microscopy techniques just kind of ebb and flow, and it's a continuous consideration to change with them. Jennifer: Absolutely. Both the Drosophila and Imaging courses are designed for imaging a specific application. The Drosophila course is all about how to prepare flies for imaging and then how to image them. The Imaging course is a little broader in that it’s imaging for neuroscience, but it’s still very much focused on that field. So they spend a lot of time on multi-photon imaging, which we don’t, because that’s commonly used in neuron imaging. In our course, we don’t play favorites in terms of what organism you want to image, and we cover a wide range of imaging modalities that can be used. In fact, somebody who has taken one of the other two courses actually has a great background for then taking our course. We like people to have a little bit of microscopy experience for our course because there’s a lot of material that takes a lot of time to absorb. Talley: When I think of our highlights, I think of the guest lecturers. Jennifer: Oh! We had Eric Betzig one year before he won the Nobel Prize. Talley: That’s a good highlight. Jennifer: The year he won the Nobel Prize, it was on my list to invite him again. Not because he’d just won but because he’s great and really fascinating to listen to. He kindly declined of course, but I had to email him anyways. I’m always very proud of the lecture series we put together for the course. Our invited speakers are microscopists who speak at big meetings in front of large auditoriums of people. For them to come here, give a lecture to our 16 students, have dinner and chat with them, it’s such a great experience. Talley: Yeah, and sometimes a student gives a presentation on something they did in the course lab that is really striking and very, very good. Just seeing the trainees’ progress. It’s not a specific moment but it’s definitely a category that we always talk about. Talley: It’s difficult to overstate the impact of taking this course. I mean, it changed my career. I came as a biologist to learn some techniques and left saying, “I think I want to do that instead.” I was just enamored with all of it. In the beginning, it was just all learning and I didn’t really feel like I had anything to give. I was absolutely terrified when I gave my first lecture, and it was on-camera! Now I feel like I have a lot to give -- I feel genuinely capable of fielding any topic in this course. The biggest change has been in my level of confidence and the relative degree of what I’m learning versus what I’m giving. It’s been fantastic. I enjoy teaching this course and I love Cold Spring Harbor because this is where things changed for me. Jennifer: I have taught at other places besides Cold Spring Harbor and I love teaching here. The support that we get is amazing. My home institution keeps asking me to run a course like this there; I said I’d consider it if they give me a team of people like the one Cold Spring Harbor has to support this course! The Quantitative Imaging: From Acquisition to Analysis course returns to the Laboratory next April and is already accepting applications here. For an inside look into the course, visit its Twitter and Facebook accounts. Phil: The typical daily schedule changes from week to week but overall, we try to avoid an information overload. For example, in the first week, we don’t like to bombard the trainees with a lot of information all at once so the schedule is kind of lecture, practical, lecture, practical. The practicals are lab bench exercises that allow the students to tinker with stuff and effectively learn how to build a microscope from scratch. We begin at 9 AM with three hours of lectures on the fundamental of optics and methods of microscopy to ensure everyone has a good foundation of the basics. After lunch, the students spend two to three hours working on optical bench rails and building small imaging systems. The systems become more complicated with each practical, from simple lens imaging to a full wide-field microscope to a laser scanning microscope (which is a bonus for some students because it can be turned into a confocal microscope). Later in the afternoon, we have another lecture that is oftentimes followed by questions that came up during the practical. There are questions the students will only ask if they’ve actually been confronted with the fact that something doesn’t work the way they thought it would; if we jumped from one lecture to the next without a practical in between, those questions would not come up and the depth of conversations would not be the same. By the end of the first week, the students move into the main lab and start working with million-dollar microscopes, at which point they have a better idea of what’s going on behind the lens. Michael: As the students transition from the optical bench exercises to the microscope, the first step is to conduct experiments designed to better understand the fundamental principles of what they’ll do in their own work. They measure the noise characteristics and resolution of the microscopes so they understand the possibilities and limitations in their experiments in a very general way. When they’re using the microscopes in the course, they’re really learning how to understand the measurements they’re making and what they mean. Florin: During the second and third week of the course, there are a lot of applications of the basic ideas taught in the first week. And in many cases, the trainees realize that exactly the same concepts are packaged in different microscopes. Fancy up-and-coming microscopes, in fact, use the same two or four lenses again and again. Lucy: In the third week, the students also work on their own course projects, which they can pursue solo or as part of a group. Michael: The final assignment of the course, right before the lobster banquet, is for the students to present the results of their projects or anything else they want to share regarding what they learned during the course. Phil: Outside of the course projects, we always have them work in at least pairs because we feel the social aspect is important. When the students do the optical bench exercises, they work in groups of 3 or 4 which indirectly becomes a team building exercise. A majority of students never thought that they could build a microscope. So there’s this team effort to overcome the hurdle of “We’re supposed to build a microscope from scratch in three hours? No way!” And they all end up doing it. Florin: They also realize that the microscopes they build, in many cases, can do as good a job as the pricey microscopes on the market. That knowledge goes a long way. If funding is a limitation, they have the experience to build their own microscope and understand exactly how everything works in it. Phil: The microscopes the students build use $40 lenses and $50-100 scanners, so they do have certain limitations. They’ll never be as good as a well-engineered, million-dollar microscope, but a homemade version can get you 95% of the way there. The critical thing is realizing what that last 5% is and whether it’s worth hundreds of thousands of dollars. When you’re doing cutting edge research, it’s important to understand where the critical components are so you know where to spend your money and where not to waste it. Florin: Getting the students to play with the lenses themselves actually makes this much more obvious. More than that, as you look at the microscope, you realize the precision of the microscope is the precision of your hands, of your alignment, and that’s empowering. Michael: The students also have the opportunity to try new things and test out ideas. We have a combination of commercially built equipment--a lab of ten of the nicest microscopes at their disposal--and equipment just for developing and trying new things. Very often, actually, the course projects aim to make a particular method a little bit better. Phil: Microscopy is one of those topics that falls between traditional departments. On the physics side, the basics of how a microscope is constructed are taught but most physics departments don’t teach their undergraduates about laser scanning microscopes or confocal microscopes. Biologists, on the other hand, use these microscopes all the time but are unfamiliar with the working principles behind the microscopes. Over the years, alumni have told us they don’t know where else they could have learned all this, that the course is the only place they could find all this information. Florin: Also, a physics book on optics can be a little dry. So if you are a biologist trying to understand imaging, learning through a book can be a long path. Being part of a course like this exposes you to all kinds of tools, principles, and techniques in optical imaging, then you actually use them to build a device. Michael: You can read a book about optics but until you get your hands on things, it’s really hard to fully grasp the concepts. Invited speakers play a major role in CSHL courses, including the Imaging course. Next, the instructors discussed the caliber of the 2017 speakers and their contributions to the course and its trainees. Michael: We schedule the invited speakers on a bit of a gradient: speakers at the beginning of the course cover basic methodologies and those toward the end talk about more specific applications. Our speakers are really, really great. A number of them have been coming to the course for over a decade, possibly even two. Phil: And they evolve. Their talks are always on their most recent research as well as what they’ve done in the past. We invite them back because they enjoy this crowd and its interactive-ness. These are conference-level speakers who give colloquia to departments or universities in front of hundreds of people. The course trainees get to be in the room with them, have lunch with them, and ask them whatever questions they have. That’s a real opportunity. Michael: It’s a completely different experience than if the person came to your university and gave a talk. In the course, the students can really ask the speakers whatever they want. And almost all of the speakers like to stay at the course for extended periods to spend time with the students. Phil: Many of our speakers are the ones who started this field. Florin: Sometimes new projects arise from these interactions; course alumni have joined the labs of invited speakers they met in the course. Phil: Let me phrase it this way: it’s the chance for an interaction that sometimes changes the course of a career. It’s the types of conversations that are had in a crowd of 12 people, in an atmosphere that encourages questions, ideas, and curiosity. There have been times when a student might ask, “I’m interested in X. Could X be used for Y?” And when a person who created X and uses it every day answers with, “Actually, X would be ideal for Y,” it’s very encouraging. The student follows a new research direction because of that one exchange. Lucy: Phil is probably the best person to answer since he’s been with the course for 15 years. Phil: I’m the best and worst person to answer this because I have a terrible memory! Fundamentally, I think the course hasn’t changed that much over the last 15 years. This biggest evolution has been fine-tuning the iterative back-and-forth of listening to lectures, followed by tinkering in the lab practicals, followed by more lectures and Q&A sessions. I think we’re in a pretty good place with that now. Lucy: The course content also evolves as new approaches come out. We really try to stay on top of the field with different preps and techniques, so the students are always exposed to cutting-edge material. Phil: More and more students are coming to the course with the word ’microscopy’ already in their background. Ten to fifteen years ago, students applied to the course because imaging was becoming big and was gaining momentum in the field of neuroscience – but not everybody was yet doing it. Today, imaging is starting to dominate. You’ll be hard-pressed to find a core facility or university without a two-photon microscope. As a result, the students now have some prior two-photon imaging or confocal imaging experience, and they want to learn what’s going on inside the microscope when they adjust settings. So the things we teach in the first week haven’t changed much. And despite students having done microscopy at their home lab before arriving at the course, they still gain quite a bit from the material taught the first week. Michael: I think there’s been an increased focus on in vivo preparation. When I was a student of this course in 1999, there was a lot of cell culture and various other preps. But imaging activity on the cortex of a mouse was not something we did. Phil: It was more limited to in vivo slices and cell cultures. Florin: Funnily enough, things that were talked about in the course 10 to 15 years ago as dream projects are actually being done now in the class by students. And we still talk about “the new dream experiment” that will probably be implemented in the next decade by people involved in the course now. As one of our most competitive courses, we made sure to inquire how applicants might increase their chances on becoming one of the 14 to 16 scientists each summer who are accepted into the course. Michael: We look for applicants who are new to imaging and understand some of the problems they’re facing, but don’t yet fully understand what they’re doing. We want to train people who will be able to return to their labs and quickly take advantage of what they learned in the course. A lot of information is taught during the three weeks so it’s important that students can attend the course, understand why they’re learning what they’re learning, and go back to their labs to directly apply their newfound knowledge. This way, the information is reinforced as soon as possible. Florin: We also look for applicants who are about to switch fields or start a new project. Michael: We try to accept a mixture of students in terms of scientific background. We have had some students from physics backgrounds who have never seen a biological specimen, but have a firm understanding of how some elements of microscope systems work. And vice versa. It’s great to have a mixture like that because the students learn not just from the instructors, speakers, and TAs, but from each other. They can ask each other questions and share their knowledge. Applicants’ personal statements should really express how the course is going to benefit their experiments or, even further, their labs. Of course, we want students with great scientific backgrounds, but the personal statement is less about selling yourself as a scientist and more about how this course is going to help you to do science better. For example, if you’re in a lab that is just starting to set up imaging but doesn’t have an electrophysiologist, that student’s participation in the course will have an impact even beyond their own research projects. Another important thing to note is that every year we reject a bunch of great students. If you really want to take this course and think this is what you need, don’t give up. We consider persistence a big positive. So if an applicant states “I applied last year and didn’t get in and now I’m applying again,” it catches our attention. Besides wanting a group of motivated students who are fun to work with and enthusiastic about the experiments, we want people who really want to take the course. Florin: It was my first encounter with the course. In 2006, I came in as a TA and was supposed to build a device in a short amount of time. Clearly, I was terrified dealing with the parts, but the instructors at that time said, “don’t worry, it’s going to work out just fine.” And indeed it did. Here, you are surrounded by extremely enthusiastic people whose encouragement makes a lot of things happen in a very short amount of time. Phil: My favorite moment happens every year and it changes in flavor: it’s that moment when the students, who have been working on a rig for hours, struggling with noise and all sorts of other stuff, finally obtain a fluorescent image. They put together this scanning microscope themselves from a table of random parts and spent an hour aligning it, and now they see a high-quality image. They literally scream and jump for joy. They’re taking pictures of their microscopes and the image with their phones, posting it on Facebook, texting it to their loved ones and colleagues. It’s the excitement of realizing that they’re capable of something they didn’t know they were capable of just a few hours ago. Michael: A lot of great moments happen throughout the course but one thing that is a pleasure to see takes place some years after a student’s been in the course. I see them post on Facebook about their new publication, and actually see the imaging they came to the course to learn. It’s always very satisfying to be reminded that the course has an impact on the students beyond just the three weeks. Lucy: I have quite a lot of favorite moments from when I was a student in the course, and now as an instructor. As a student, it was building my own two-photon which was amazing: I was elated when I took the image. And now as an instructor, my favorite part is seeing all the students get to that same pinnacle and realizing they can do it. I enjoy seeing the motivation and excitement in students when they’re able to address a question they’ve always wanted to address. The Imaging Structure & Function in the Nervous System course this summer will take place between July 24th and August 13th. Applications are being accepted until this Sunday, April 15th here. For an introduction into the course from a trainee, be sure to read our Q&A with 2017 Alumna Janani Sundararajan.